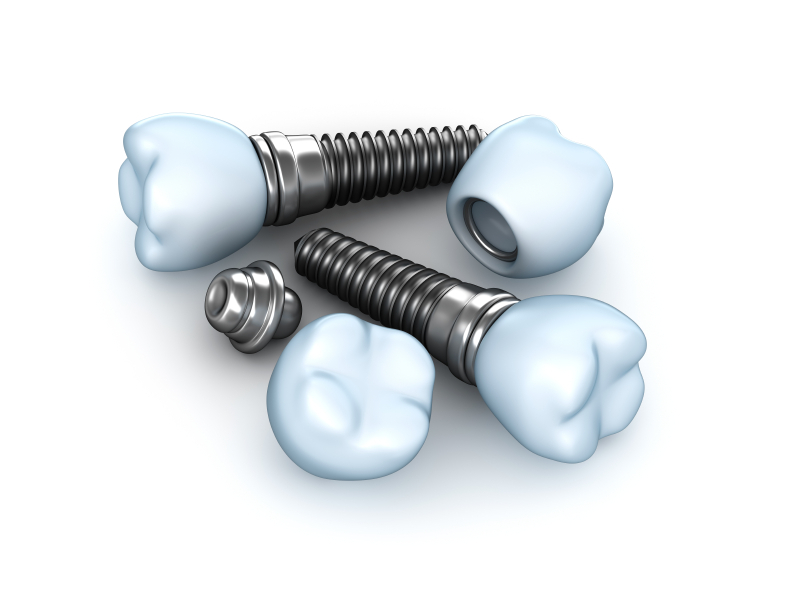 Dental implants consist of three components to replace the root and the crown of the tooth. To benefit from dental implants, you must undergo a multi-phased treatment process that is established after performing a consultation. During the initial consultation, an examination of your oral health and medical history will be completed to determine if dental implants are right for you. You must have healthy gums, adequate bone density to support the implants, and minimal risk factors for implant failure. CBCT technology is used to create 3D images of your mouth. This is needed to assess your jawbone to create guide for implant placement. The first phase of treatment involves surgically placing a titanium post into the jawbone. The jawbone will then fuse to the implant post because it is made from bio-compatible material. As a result, your replacement tooth will have a sturdy foundation to be securely held in place. Not to mention the implant post stimulates bone growth to preserve your bone density. After your jawbone has fused to the implant post, you will undergo a second procedure to attach an abutment to the post. The abutment is needed to hold the prosthetic crown to the implant post. Plus, the abutment will allow the gum tissue to heal correctly for a natural look. Once the gum tissue has healed, you will undergo the final phase of treatment—the restoration. Restoration involves attaching the custom-made prosthetic tooth to the abutment. When the entire process is complete, you will have a lifelong solution to treat your tooth loss. If you are ready to restore your smile with dental implants, the first question you will have is “where is an implant dentist near me?” Horsham Dental Elements offers dental implants to replace missing teeth. No matter if you are missing one tooth or all your teeth, we have the implant options you need to regain your confidence with a complete smile. We will perform the consultation needed to determine if dental implants are right for you. We offer the most advanced technology to create a customized treatment plan that is supported by precision and accuracy. Throughout the entire process, we will provide you with the comfort and peace of mind you need to restore your smile. If you are ready to gain a complete smile with a permanent solution, contact Horsham Dental Elements today to schedule your consultation. Dr. Henkel will create the individualized treatment plan you need for a natural-looking new smile.